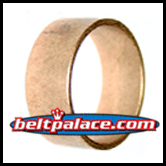 200349A Comet Bushing, Bronze (Single Pack). Fits Comet 20/30 Series, TAV Go Karts including Kenbar 300-008, Comet 200349. Home > Comet Clutches and Parts > Comet 219572A. Movable Face with Splined Hub. > Comet 219573A (20 Series) Fixed Face and Post (Engine Side Sheave) > 200349A Replacement Bronze bushing (Single Pack) for 3/4" Bore Drive Clutch. 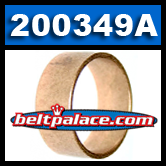 Comet Industries part 200349A replaces worn out or lost bronze bushings on Comet TC88, 20 Series, 30 Series (except 30-100), and older model TAV Go Karts including Kenbar 300-008, Comet 200349 models. This bushing is a common replacement part for Comet clutches in Go Carts, Golf Carts, Jonsered Iron Horse (5/5.5HP Models), and Boonie/Mini-Bikes. Made by Comet Industries. Replaces original Comet 200349 part. NOT for 1" Bore Clutch. Jonserd/Lennartsfors Part: 5310001-52. Comet Industries part #204332A 3-Pack of �Black� non-snap Insert buttons replace worn out, lost or broken buttons on Comet 20 Series, 30 Series, and TAV Go Karts. Same as MANCO GO CART'S Lower Torque Drive Buttons "Manco 6804". Kenbar 300-015A models.